You deserve to be in a truck that impresses you with the way that it is designed. You would love to have a truck that impresses those who see you, as well. The popular Ford F-150 Raptor is a well designed and beautiful off-road pickup truck. There is a special package available for the Ford F-150 Raptor that transforms the look of all of the seats in the vehicle. If you want your seats to stand out because of their bold color and special design, you will love all that this package can do for this truck. 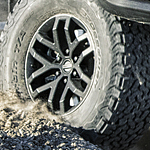 The color options that are available for the exterior of the Ford F-150 Raptor will impress you. You will be happy to go through the list of colors and imagine how each one is going to look on a truck that you use to get around. You will find a fun color option that fits with your life.